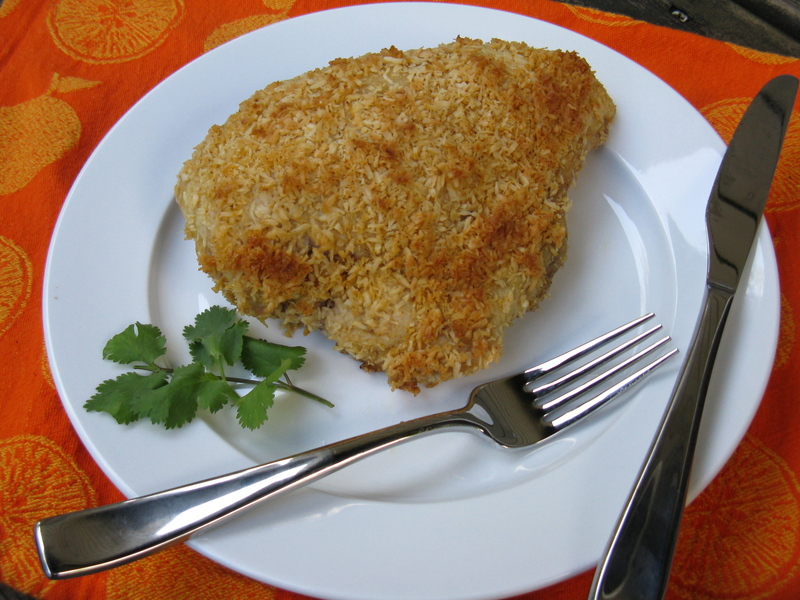 There’s a tropical thing going on with this coconut-crusted ginger chicken and it is darn delicious! The ginger adds a bit of zest and the unsweetened coconut provides great texture. The chicken itself is tender and juicy, just as it should be. Also, it’s officially the week of my wedding! It’s so hard to believe it’s finally here. I’m so excited for the end of the week, so I can be done with this term, see my family, marry Jesse and celebrate. Even though I’ve been pretty stressed out (mainly because of school), it’ll all be worth it. I’m so blessed in this life. Preheat oven to 350 degrees. In a small bowl, mix together the coconut, ginger, sea salt and cayenne. Pour mixture onto a dinner plate and spread around, so plate is covered. Meanwhile, pour the melted butter on the chicken and quickly use a brush to make sure it’s well coated. Then, while it’s still wet, quickly dredge in coconut mixture. You can pat the mixture on as well, to make sure it’s covered. Alternatively, instead of the butter, an egg wash will work as well. A single beaten egg will probably suffice. Bake in preheated oven for 45 minutes or until cooked through. Check about halfway through to make sure coconut is not too brown. If need be, tent some foil over the top after it’s reached your preferred level of brownness. Serve with veggie of choice. Congrats on your upcoming wedding! I remember my wedding, it was so fun and I had a great maid of honor that really helped me to stay relaxed and to just enjoy the day. It seriously flies by! Remember to just soak it in and love every minute. I think I’m going to try that chicken recipe tonight! Thanks for your kind words! I’m not stressed about the wedding itself because it’s so small scale, so that’s a bonus! It’s just our parents, siblings (2 will be missing though) and a long-time friend who is officiating the wedding. That’s it. We’re having a larger scale celebration (reception) in September back in our hometown. It will all be great! Oh, and I hope you like the chicken! I agree! It’s definitely what’s right for us, too. I like the addition of cayenne pepper. The extra zing sounds fantastic! Thanks! I don’t like things crazy spicy, but I love a little bit of heat. I adore you lady!! I am so happy for both you and Jesse!! Love love and more love to both of you!! Thanks and congrats to you on your recent wedding! Thanks, I’m super excited too! Gonna be trying this. 😀 YUM!